Sofitel Ambassador Seoul presents a special "World's Best Curry" festival to celebrate the season of graduation and entering. Curry, known to prevent aging and cancer, is one of the most familiar well-being delicacies up to date. The festival features various curry dishes from all over the world including Thailand, Indonesia, Malaysia, India, Pakistan and Italy. That's notable is that the festival is hosted by the 2 main restaurants, buffet restaurant "King's" and the dining restaurant "Café de Chef." Also, do not miss the astonishing events below for your lucky dining. 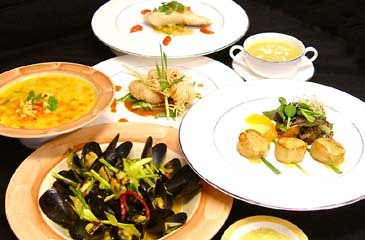 First, Café de Chef offers a complementary bottle of wine or champagne with order of course menu. Also, tables with four or more guests will receive a free celebrating cake and a free photo shooting. A welcome drink coupon at Gran*A will be given free to all students at Dong-guk university. The buffet restaurant "King's" features a special dart event "Throw Your Luck" for graduating and entering students. A free buffet voucher for two persons is given to guests with all three darts matching with three lucky card numbers, two lucky numbers for a free cake and one number for a beverage. Enjoy your back-to-school with world's most popular curry feast at Sofitel Ambassador Seoul. Place: Buffet Restaurant "King's" & Dining Restaurant "Café de Chef"
1) Restaurant "Café de Chef"